Chicago, June 6 – Life Time — Healthy Way of Life today announced a new partnership for one of its marquee Life Time Events, beginning a two-year presenting sponsorship between MY FIT KEY and the Chicago Half Marathon & 5K. 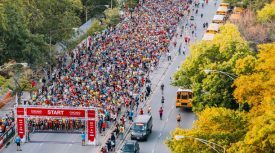 The 22nd Annual Chicago Half Marathon & 5K Presented by MY FIT KEY, will take place on Sept. 23, 2018 and will introduce the endurance community to DNA testing for athletes. The Chicago Half Marathon & 5K Presented by MY FIT KEY is the second of two races in the 2018 Chicagoland Half Marathon Series, which also included the May 20 Byline Bank Chicago Spring Half Marathon & 10K. Participants who complete both half marathon distances will earn a custom, 26.2 Challenge finisher medal at the final event. Currently, more than 1500 athletes are registered for the Series. Benefiting charity partner Chicago Run, the Chicago Half Marathon & 5K is centered around Chicago’s historic Jackson Park, once home to the 1893 World Columbian Exposition. The course highlights Chicago’s historic south shore and features a traffic-free Lake Shore Drive–the only Chicago race to completely shut down this main transportation artery. Runners traverse the streets through Hyde Park and the Museum of Science and Industry before taking on the north and south Lake Shore Drive lanes and finishing at the Statue of the Republic or “Golden Lady” as she’s known to locals. Participants receive a participant shirt commemorating the 125th Anniversary of the World Columbian Exposition, finisher medal (the largest in the midwest) and access to the legendary finish festival featuring a live concert, Lagunitas beer, pizza and more. Registration is $105 for the half-marathon distance and $40 for the 5K, and is available at chicagohalfmarathon.com. Life Time champions a healthy and happy life for its members across 135 destinations in 38 major markets in the U.S. and Canada. As the nation’s only Healthy Way of Life brand, Life Time delivers an unmatched athletic resort experience and provides a comprehensive healthy living, healthy aging and healthy entertainment experience that goes well beyond fitness to encompasses the entire spectrum of daily life for individuals, couples and families of all ages. More info is available at www.lifetime.life.